KitsUK is the nations biggest bespoke lifestyle kitting system developed to meet the needs of the corporate gifting market. This year we teamed up with High Profile Ltd in a collaboration to grow the service with more products and features to deliver even greater value and choice than ever before. KitsUK is the nations biggest bespoke lifestyle kitting system developed to meet the needs of the corporate gifting market. This year we teamed up with High Profile Ltd in a collaboration to grow the service with more products and features to deliver even greater value and choice than ever before. The kitting service is a trusted solution for specifiers and end users looking for more creative branded merchandising. It’s the ability of the kit concept to communicate complex brand messages that is at the heart of its appeal. And there is almost no limit to what a kit can be. Choosing from a huge menu of standard components, it’s easy to configure a kit that’s just right for your message or marketing activation. 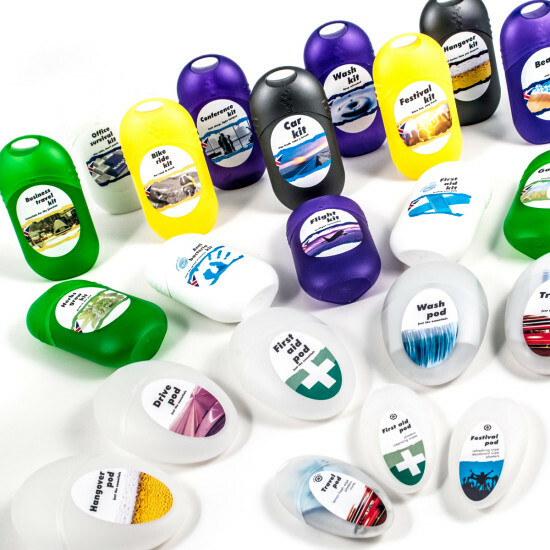 With an attractive pod container and colourful personalised labelling, let your imagination loose! As the name suggests, this is a UK service which is really important to clients with stringent ethical and sustainability policies. Made in the UK, the product is fully compliant with EU standards of quality manufacture. Cutting manufacturing costs and lead times is key to delivering a rapid response service, even the “Pebble” container is injection moulded here in the UK so there’s no need to wait around for Far East shipping. This friendly, rounded pocket sized pod is perfect for most kits and can be Pantone matched to suit your brand. 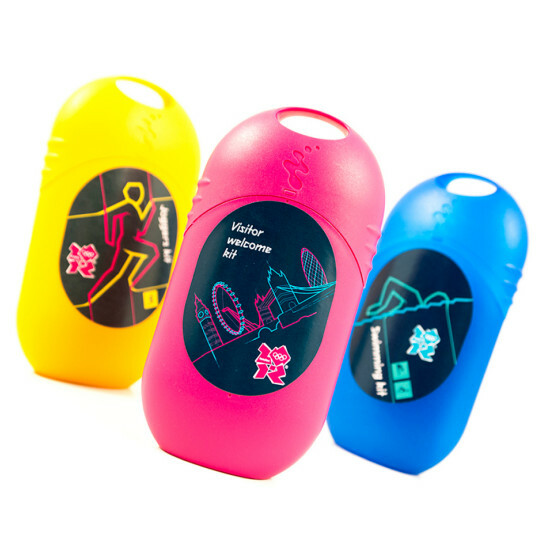 Kits for the London 2012 Olympic & Paralympic Games were produced in super bright colours along with label designs featuring the tournament look and feel. Visitor and Welcome Kits are a great way to say hello to guests arriving from overseas. It’s great to offer a branded gift that is genuinely useful. So much merchandise is simply disregarded because it serves no purpose; the Pebble pod goes further by offering a handy reusable container. So once the contents are used up, the pod can be re-purposed for all sorts of uses. 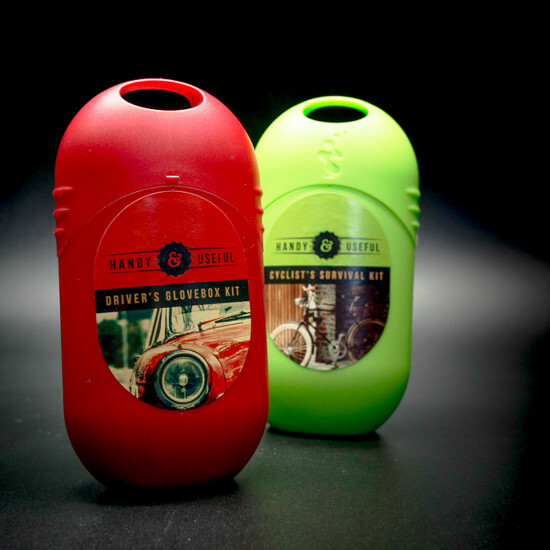 Highly popular kits such as the Cycling Kit and Glovebox Kit can be styled to suit a sporty or sophisticated market just by a colour change of the pod or graphical design. Strong market sectors for kits are – lifestyle, business, travel, sports, home and leisure. Typical end users are – Banking, IT, Engineering, Event organisers, Estate agency, Insurance, Technology, Pet food, Airlines, Railways, Car manufacturers and dealerships, Cruise ships, Sports clubs and Charities.